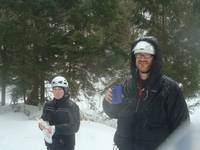 COE Adirondack Ice Climbing Class. Drove to the Dacks Friday night. Saturday we woke early and climbed four lines around Lions on the Beach in Chapel Pond Canyon. Came back to Tammy's house and had a great dinner, ate fresh baked cookies, and watched the movie 127 Hours. Sunday it poured rain, so we bailed and drove home in what turned into the biggest snow storm of the year. I had a 5' drift in the back yard... looked like I was building another quinzee. Guy was in town visiting, and it took the two of us an hour to shovel a car-width path down the driveway.